a Reproduced from E. J. Lien, J. Kuwahara and R. T. Koda, Drug Intell. Clin. Pharm., 8, 470 (1974). 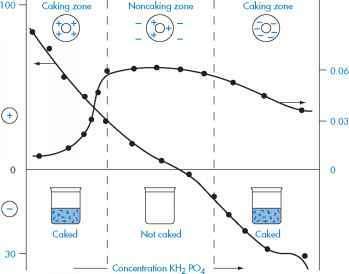 b At pH 2 and pH 4. c At pH 4.0 and pH 7.2. Preservatives such as the methyl and propyl parabens present in formulations can be sorbed into rubber and plastic membranes and closures, thus leading to decreased levels of preservative and, in the extreme, loss of preservative activity. This is a topic which requires a chapter to itself for full coverage. Here we have space only for a treatment of mechanisms of protein binding which might enable readers to recognise molecules likely to be protein-bound. High levels of protein binding alter the biological properties of the drug as free drug concentrations are reduced. The bound drug assumes the diffusional and other transport characteristics of the protein molecule. In cases where drug is highly protein-bound (around 90%), small changes in binding lead to drastic changes in the levels of free drug in the body. If a drug is 95% bound, 5% is free. Reduction of binding to 90% by, for example, displacement by a second drug, doubles the level of free drug. Such changes are not evident when binding is of a low order. Most drugs bind to a limited number of sites on the albumin molecule. Binding to plasma albumin is generally easily reversible, so that drug molecules bound to albumin will be released as the level of free drug in the blood declines. Drugs bound to albumin (or other proteins) are attached to a unit too large to be transported across membranes. They are thus prevented from reacting with receptors or from entering the sites of drug metabolism or drug elimination, until they dissociate from the protein. 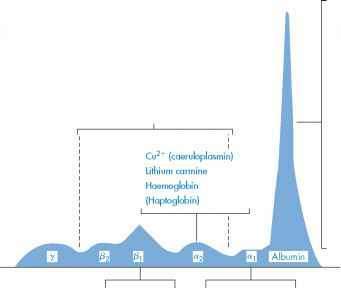 Plasma albumin consists of a single poly-peptide chain of molecular weight of 67 000 ± 2000. Human albumin contains between 569 and 613 amino acid residues. It is a globular molecule with a diameter of 5.6 nm (calculated assuming the molecule to be an anhydrous sphere). With an isoelectric point of 4.9, albumin has a net negative charge at pH 7.4, but it is amphoteric and capable of binding acidic and basic drugs. Subtle structural changes can occur on binding small molecules. Fatty acid binding produces a volume increase and a decrease in the axial ratio. This is due primarily to nonpolar interaction between the hydrocarbon tail of the fatty acid molecule and the binding site, and reflects the adaptability of the albumin molecule. When a hydrophobic chain penetrates into the interior of the globular albumin molecule, the helices of the protein separate, producing a small change in the tertiary structure of the protein.